Before moving to London last year I was all sorts of crazy. Not crazy crazy but there was A LOT going on between leaving my job, packing, and saying goodbyes. I didn't know what I was going to do professionaly but I knew that I wanted to put my creativity to use outside of a nine to five job. Looking for some inspiration and direction I borrowed a copy of The Artist's Way from a friend and began my own little quest for living a more creative life. I didn't get to finish the book before moving but I did take one major thing from it: morning pages. Morning pages is the exercise of taking time every morning to put pen to paper for three entire pages. You can write more but you cannot write any less. It's your brain drain space to write whatever is on your mind be it dreams from the night before, the day's to-do lists, life goals, worries, troubles, anything! And if you're drawing a blank and have nothing to write, well then you literally write "I have nothing to write" and after a few sentences of that your mind will wander onto something else and voila - you'll have something to write. I've been amazed at how natural and motivating the exercise can feel. Even when I wake up on the wrong side of the bed and feel like it's going to be one of those days, all I have to do is write exactly that and respond to myself "snap out of it Ana Maria! " and you know what, I totally do. Creatively I start to draft "aha" moments without even realizing it. It's the best type of brainstorming because you give yourself permission to just sit and write whatever you want without any other motive. Kind of like those shower moments - just you and your thoughts, sans the soap. Writing my morning pages is what led to opening The Pond Market, deciding to pursue graphic design and photography as freelance careers, and they have genuinely helped me adjust to two new homes. It's healthy to get things out, get them sorted, and for me, writing is the easiest way of doing that. No one but me sees the contents inside and I look forward to my one-on-one time in the mornings. If I skip a morning or two I definitely miss them but I know that they're there for me when I'm ready. It's a grown up version of "Dear Diary" but whereas before I was gossiping about my 4th grade crush Francis (he had the coolest hair) I am now sharing my thoughts in order to live my best life every day, in every little way that I can. Living with intention and action - that's the goal and morning pages are my way of making it happen. 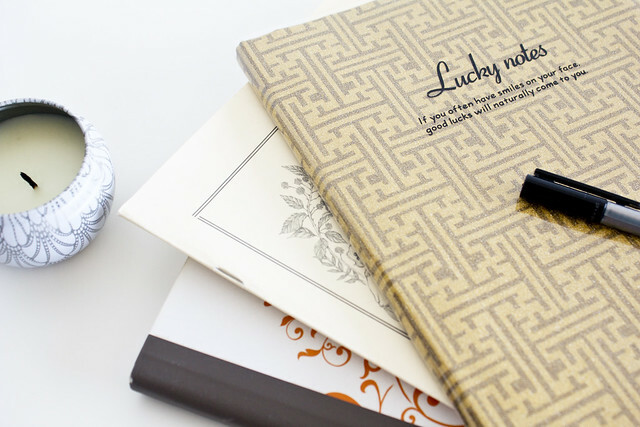 I'm completely in love with my latest notebook titled "Lucky Notes". I bought it at a local stationary shop and it's too too perfect for the purpose. Have any of you read The Artist's Way or practice something similar to get your thoughts sorted?